Addis Ababa (Ethiopia) – July 16, 2018 (travelindex.com) – Ethiopian Airlines, the Largest Aviation Group in Africa and SKYTRAX certified Four Star Global Airline, is proud to announce that it has taken delivery of the largest B737 MAX fleet in the Continent on July 2, 2018. 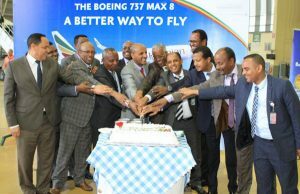 Ethiopian Airlines Group CEO Mr. Tewolde GebreMariam, said, “It is an immense honor for all of us at Ethiopian to reach this milestone a few days after we colorfully marked our 100 fleet milestone and the latest acquisition is an affirmation of our continuing pioneering role in African aviation and the successful implementation of our fast, profitable and sustainable growth plan, Vision 2025. Today, We are glad to include the B737 MAX 8, the latest in Boeing’s singleaisle series, in our young and modern fleet family with an average age of less than 5 years.